When you travel, it is important to time and adapt your itinerary to light and place, emphasizing more on the right kind of photography in a specific place at the right time of day than on simply layering photography as a pastime over a standard tour. In Morocco, I met the woman I eventually married. Sometimes I blame it on the light. No, that's not correct. Sometimes I credit the light for having shown -- er, shone -- her to me right. We were part of a muster of youth activists meeting in Morocco, in a desert (and nearly deserted) village outside of Ouarzazate, the notable but small city on the open plateau just south of the High Atlas Mountains. To reach and later return from the distant village, we spent a full day hiking across the sun-blanched highlands, donkeys weighed down with our backpacks, the landscape broken by surprising "ruins" from the film sets of Kundun. Or was it The Mummy? Once installed in our rudimentary adobe but hospitable homestays, we circled up during the days under or near a traditional, low-hanging Berber tent, depending on the strength of the late-autumn sun; at night we huddled together for warmth around broad platters heaped with homemade bread and steaming, aromatic Moroccan cuisine like couscous, pastilla or tajine . My memories of that time, though rich, satisfying and cast in that incomparable light, are terribly spotty. Like so many things in life these days, I'm guided principally by the photographs I've accumulated from that time. For those of us not blessed with total recall, such archival cues are critical. I just deeply wish I had taken more pictures and that those I took or collected from colleagues were more evocative and of better quality. I wish I had taken a photography workshop in Morocco. Given how much of a watershed moment it was for me, I kick myself for not having understood how to capture that special light, and with it those first impressions of a beautiful woman who remains a guiding beacon. Lest you too make the same mistakes I did, I turned to an expert for help. Alex Ros is the owner of Open Sky Expeditions, which runs specialized photography tours in Morocco through and well beyond the same open reaches south of the High Atlas Mountains where I met the light of my life. With Alex's guidance, I pulled from a selection of his stunning pictures from Morocco and crafted descriptions of the kinds of things to keep in mind when taking images like those exhibited. 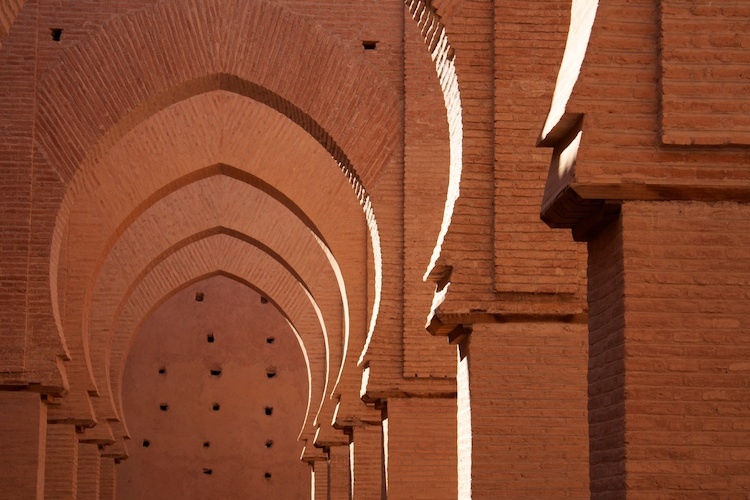 Think of this as Photography in Morocco 101, a teaser designed to get you thinking about the range of options open to you and how to make sure you're prepared. Prepared for making the most of the visions around you, perhaps even one that you may decide to keep with you... until death do you part. At Tin Mel (also called Tin Mal), located about 2.5 hours from Marrakech, a deconsecrated, traditional, 12th-century Almohad mosque is open to non-Muslims. That being said, visitors are sometimes few and far between, making time inside the mosque truly precious to those enamored of the space. The mosque's roof collapsed a long time ago, so light -- a pure and unpolluted mountain glow -- floods in from above and accents the remarkably photogenic contours, textures and shapes of the interior architecture. Different lines of sight and perspective reveal changing patterns of light, shadow and all gradations of red through layers of recurring and overlapping geometry. Photographers love to play with this kind of setting. They take tons of pictures, framing the same things in different ways -- with key eye-catching qualities centered or offset, included in full or cropped, entirely in focus or more selectively so -- knowing that a few of them will strike a perfect balance. The picture above was snapped on a bright afternoon in early February. It is crisply focused with the arches off center and unanchored so that the eye is led down the line of side-lit columns. It's motion in stillness, a dance of light and color via an interplay of patterns and contrasts. 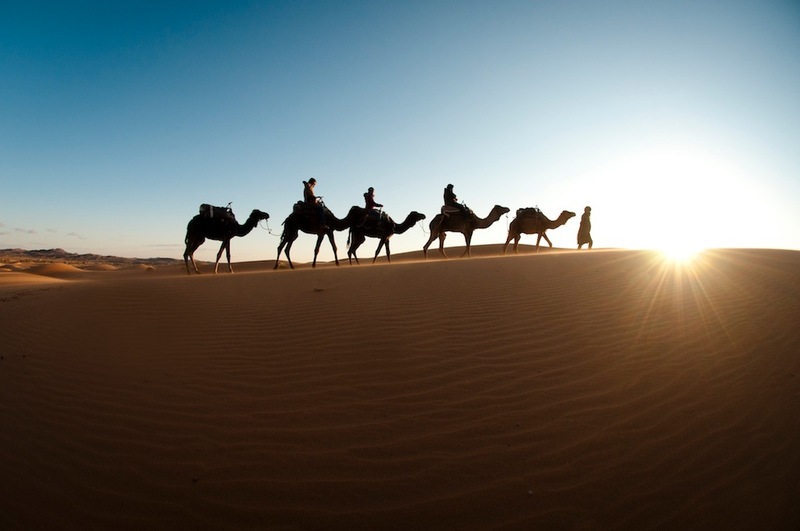 Travelers to Morocco eager to experience an erg (the Arabic word for a large sea of dunes) head to one of two accessible Saharan sites: Erg Chebbi, near Erfoud, or Erg Chigaga, near Zagora. 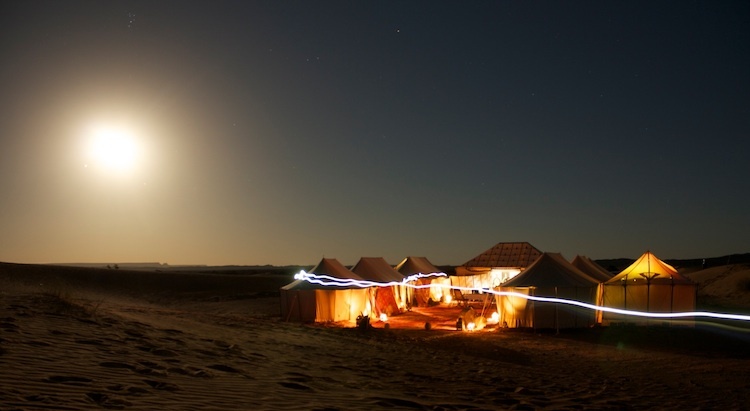 The picture above was taken just outside of a private desert camp used by Open Sky near Erg Chebbi. The camels are those used to traverse the dunes on the way to the camp; they are being escorted off to their own comfortable beds. 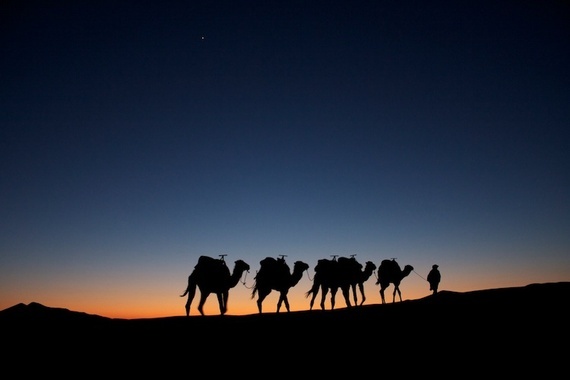 Although sand dunes offer incredible challenges and fantastic opportunities to photographers, this picture is more about using silhouettes and the stark outline of the desert to seize upon the warm colors and calm of twilight. In this case, the photographer tried several shutter speeds and lens apertures, choosing to balance crisp focus and frozen action against a backdrop of just enough light. A slower shutter speed, for example, might have resulted in blurry and weaker silhouettes, and a sunset glow that wasn't as fiery or in as strong a contrast with the dark skies above, dark enough for stars to begin emerging. The dune fields at Erg Chigaga are much harder to reach than those at Erg Chebbi, but they're worth the effort. And, just as at Erg Chebbi, Open Sky plunges further into the desert and overnights in an isolated, private desert camp for a real taste of the Sahara, complete with Bedouin custodians. Most of the patient local staff understand and accept the camera-centered purpose of a photography tour, and sometimes agree to portraits. In a place like Morocco, though (or, for that matter, anywhere), one must always secure permission to take pictures. Little if any dialogue is required: just the slight heft of a palmed camera, usually met with an accepting nod. The more this is part of a smiling, non-photographic interaction, the better. But there are many other impediments in portraiture, not the least of which is capturing the hidden inner humors of a subject, visible only through his or her outer shell. Penetrating gazes, raw emotion, physical strength, social bonds -- all lend themselves to this. Getting a good picture can often involve a split-second reaction to being in the right place at the right time. The picture above is a portrait of one of the Bedouin caretakers of the desert camp near Erg Chigaga. It was, fittingly, a spur-of-the-moment shot, taken just before sunset, catching, after nodded permission was granted, the man's moment of peace as he lounged and watched from a distance. The use of black-and-white accentuates the subject and imbues the whole photograph with an iconic timelessness. It really could have been taken 100 years ago. The draw of the man's gaze was given even greater force by a wide aperture that kept only the man in sharp focus, as well as the post-processing use of a very light vignette effect that darkened the four corners. Some things pass as perfectly normal in Morocco that may be less commonplace elsewhere. 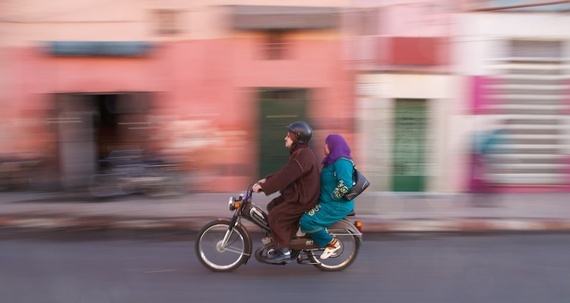 Couples and sometimes entire families rely heavily on motorbikes for their daily commute. It can, in fact, be rare to see one person alone on two wheels. Many men also wear long loose-fitting peak-hooded robes called djellabas. And house slippers on women are routine. Though it can be a lot to demonstrate all of this through photography, this image succeeds. Stopping motion in photography is not an easy skill to learn. It involves choosing an appropriate shutter speed, identifying a moving target, panning the camera at the same speed as that target and taking the picture against a chosen background. The fluidity of the panning motion, gauged to the speed of the target, is the hardest thing to master. The image above was taken early in the morning at a time of routine commotion. It is the best of approximately two dozen attempts, only a quarter of which achieved the required sharpness of focus. The strength of the photograph also stems from the variety of color, shape and texture in the background, not to mention an instinctive sense of how normal their ride is (very normal), how warm it was that day (mild, but with a slight morning chill) and the nature of the relationship between the two riders (long-practiced familiarity). This is the private desert camp near Erg Chebbi. It is a small camp for a small group, designed for a sense of intimacy. 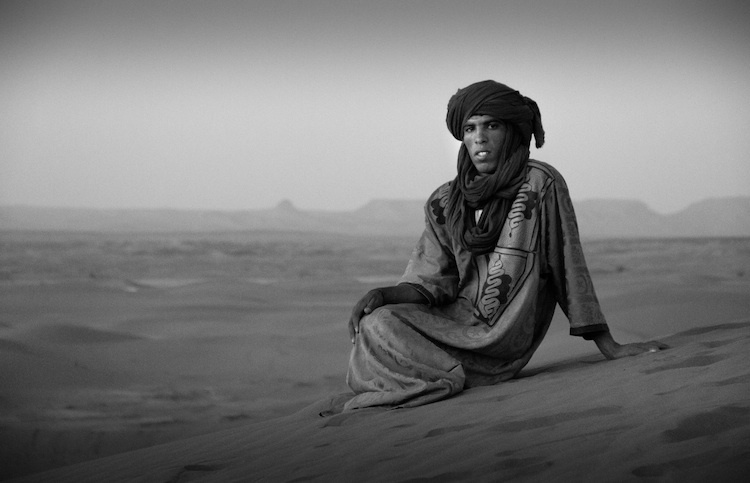 The fabled larger dunes of Erg Chebbi are directly behind the photographer. The photographic technique on display here is "light painting," which involves the use of a moving hand-held light source, or sometimes by moving the camera itself. Light painting also refers to images lit by moving lamps outside the frame or hidden from view inside the frame. In this case, there are several techniques at play: the overexposed moon, aglow like a night sun; the tents, warmed to a surprising intensity by their individual lanterns; and a distinct, curious and inexplicable streak of light that enters the frame from the right and pushes into the heart of the camp (a very bright out-of-place firefly?). The image was taken using a tripod and a long exposure, probably about 20 seconds. The tent farthest to the right was specifically "painted" from the inside for the purpose of the image. The phantasmal streak of light is also by design. After opening his lens, the photographer ran into and through the picture with his iPhone flashlight illuminated and held overhead. The light was recorded, but not the person holding it. 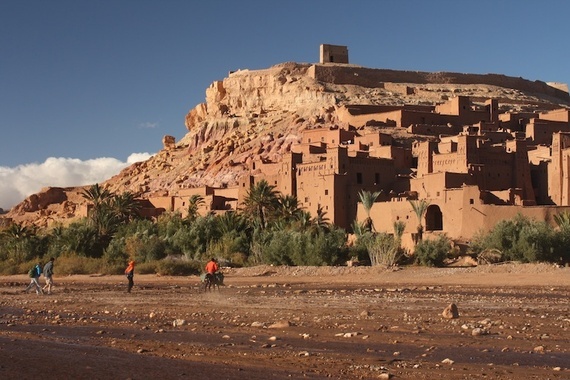 The picturesque ksar (fortified city) of Ait Ben Haddou, the largest and most intact clay-brick structure in Morocco, is one of the country's eight UNESCO World Heritage sites. The collection of earthen edifices, built using typical pre-Saharan earthen construction techniques, is surrounded by a reinforced rampart and pushes up the slopes of a hill alongside the Ounila River. Although the oldest of the present buildings dates from the 17th century, the site has been in use since at least the 11th century, including, in modern times, as the modern setting for a score of internationally known films. Doing photographic justice to a setting like this, unique in its history and location, requires some forethought and patience. A good landscape picture has scale, balance and solid structure, all of which are represented in this image. The people in the middle foreground, wearing bright jackets, help provide a pivotal gauge of size, as well as a color counterpoint to the monochrome of the ksar. Structurally, the rule of thirds is very apparent here -- especially the horizontal bands of changing color and content, ranging from light blue at the top to muddy at the bottom -- as are the angled lines of composition that give the photo both depth and foundation. Also important are the time of day and positioning, balancing half of the image in bright sun and half in growing shadow. When you travel, it is important to time and adapt your itinerary to light and place, emphasizing more on the right kind of photography in a specific place at the right time of day than on simply layering photography as a pastime over a standard tour.